nails that i have just finished (and haven’t cleaned up yet). i don’t think i can stand having normal nails since i started doing designs, it’s taking over brain. 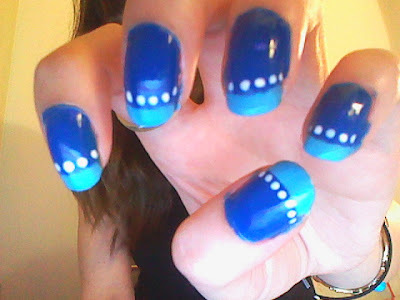 anyways, two coat dark blue, tips in light blue and use a bobby pin dipped in white polish for the dots. really simple and can be done with any brand nail polish and any colours!